Provenance: 1) A Private New York Collection formed during the early 1960s. 2) The Tim Misenhimer Collection, Bel Air, California. This ballplayer is in an active but a stable stance in anticipation of a ball game, knees bent, in an almost defensive action. He holds a weapon with three points in his left hand, and the ball in the right. He wears a helmet-like headdress adorned with a red crest. He wears the thick, red protective shorts of a ballplayer, and portrays ample-sized feet, enhancing stability. 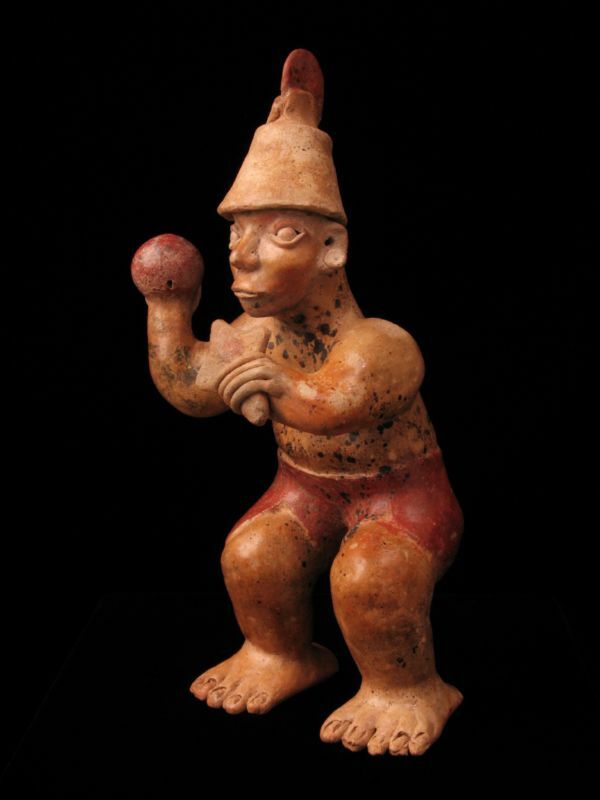 He has been identified as one of a few very highly refined works of a master sculptor in ancient Jalisco.